Death rendered as beauty in Millais' painting of Ophelia. The model is Elizabeth Siddal, the wife of artist Dante Rossetti. Dante and Millais started a gang together called the Pre Raphaelite Brotherhood. One of the benefits of being in the gang was you got to paint the other guy's wife. Another benefit was that you got a free subscription to their magazine, which was called The Germ. Millais had Siddal pose in a bathtub using lamps to heat the water. Once when the lamps went out Millais continued painting letting poor Elizabeth freeze for hours. Elizabeth's father believed this one session caused her to catch a cold and he charged Millais £50 for medical expenses. For the natural scenery Millais went down to the Hogsmill River in Ewell. He spent five months there. The scene is described in Act IV, Scene VII of Shakespeare’s Hamlet in a speech by Queen Gertrude. There was originally a water vole swimming next to Ophelia but after some of Millais' friends couldn't figure out what it was (rabbit? cat?) he painted over it. If you're ever lucky enough to see this painting unframed there is a rough sketch in the upper corner. Ophelia is mimicked many times in pop culture. Kylie Minogue imitates the pose in Nick Cave’s music video for Where the Wild Roses Grow and Kirsten Dunst poses the same way for her movie Melancholia (2011). "My martyrdom is more trying than any I have hitherto experienced. The flies of Surrey are more muscular, and have a still greater propensity for probing human flesh ... I am threatened with a notice to appear before a magistrate for trespassing in a field and destroying the hay ... am also in danger of being blown by the wind into the water, and becoming intimate with the feelings of Ophelia when that Lady sank to muddy death, together with the (less likely) total disappearance, through the voracity of the flies ... Certainly the painting of a picture under such circumstances would be a greater punishment to a murderer than hanging." 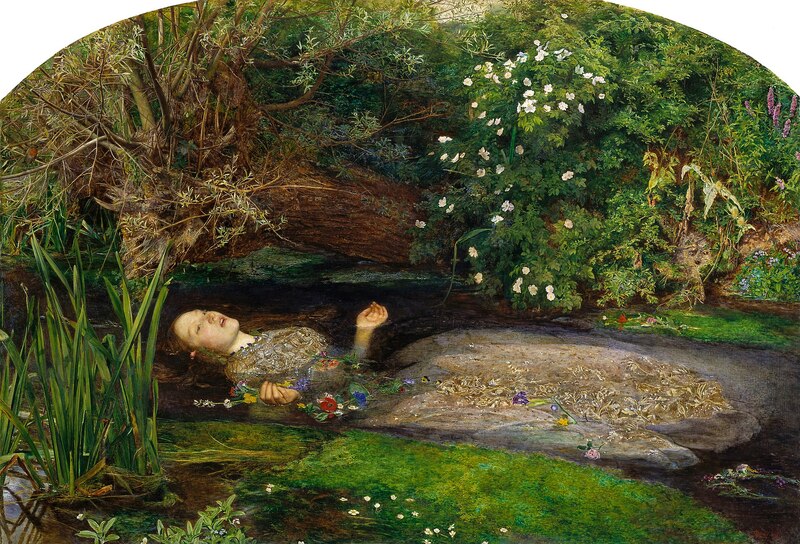 Interestingly, it was his model of Ophelia, Elizabeth Siddall, who truly suffered. Siddall had to lie in a bath of water, heated by oil lamps, and caught a cold so dangerous her father threatened to sue Millais for £50. Unfortunately for Millais's, his mournful painting of Ophelia was shown at the Royal Academy Exhibition in 1852 — the same exhibition that Arthur Hughes debuted his entirely more vibrant, expressive portrait Ophelia. Critics panned Millain's Ophelia, and The Art Journal offered his only backhanded complement, saying: "Yet what misconception so ever may characterise these works, they plainly declare that when this painter shall have got rid of the wild oats of his art, with some other vegetable anomalies, his future promises works of an excellent, which no human hand my have yet excelled." Ophelia is a painting by British artist Sir John Everett Millais, completed in 1851 and 1852 and in the collection of Tate Britain in London. It depicts Ophelia, a character from William Shakespeare's play Hamlet, singing before she drowns in a river in Denmark. The work encountered a mixed response when first exhibited at the Royal Academy, but has since come to be admired as one of the most important works of the mid-nineteenth century for its beauty, its accurate depiction of a natural landscape, and its influence on artists from John William Waterhouse and Salvador Dalí to Peter Blake (artist) and Ed Ruscha. Check out the full Wikipedia article about Ophelia (painting).